16 September 2014, Florence in Italy: it was a unique and wonderful opportunity to meet Ryosuke Cohen, his art, new friends at circolo degli artisti casa di Dante, among masterpieces of the past. Everything and everybody, the situation was just “perfect”, the collaboration, wishing to understand/catch as much as possible from the situation. Ryosuke shown us unexpected sides of Japan and art and humanity. On Tuesday, September 16th, 2014, late in a sunny morning, wearing my favourite azure silk dress, Florence was on my way. The origin of my journey was the island of Ponza, in the very center of Mediterranean, where I had performed “Sherena Velella” at the finissage of an exhibition. A not so easy travel – by ship, bus, delayed trains and a final yellow taxi had conducted me to Dante’s house. There, along with my two pieces of heavy luggage, I was promptly hearty welcome. Instantly I felt at ease and started to get acquainted with the president of the circolo Lella Marchini and those present, waiting for Gianni Broi (the curator) and Ryosuke with Noriko (his wife) to turn up. The room was/is beautiful, with all the portraits/paintings of “macchiaioli” hanged on the main walls and one could have felt (I did) a bit overwhelmed by the history. Ryosuke Cohen was not new to me, I had met him in Minden, Germany in 2009 and on that occasion he already made a silhouette portrait on one of his brain cell sheets he is known for. These are collages of stamps, stickers, whatever comes from the network and that are chosen/selected by the artist to express a sort of inside essence of what’s going on worldwide. After a while, Gianni arrived. As we were all busy/worried about contacting Ryosuke, at some point, around midday, he magically materializated with his wife at the entrance. He looked radiant and calm, happy to be in Florence (for the first time, as he explained later). The interview was difficult every now and then because both parts had to communicate in a foreign language. Though, the practical part fully explained the core of his work. He sketched the profile of the presents, one by one. Noriko took pictures, that he could refer to for completing the portraits. Gianni was busy in collaging the frame of the honorary citizenship that he had prepared and also adjusting/reducing the size of the poster to fit the drawings’ briefcase I suggested to stick on the back of the big parchment, a significant piece of Gianni’s mail art (a green rectangle with a little mole asking “ what’s the magic formula?”) that Ryosuke had included in brain cell # 147 sent in 1985 for a mail art exhibition at Uffizi in Florence. The mole seemed happy to continue her journey to Japan! “Birth of Venus” by Botticelli, emerging from the foam of Mediterranean Sea was on my mind, from time to time. Though, the “real” sonorous hair I had used in Ponza, and other proper performance stuff could remain in the luggage. During the meeting a real and true spirit of mail art took shape as a cooperative attitude. Everybody was at the same level, sincerely aimed at making things happen at their best. Perhaps art belongs to the ones that just make it, with a sense of being at service of a common goal?! The reality, topped with an ice cream eaten nearby later, before saying goodbye, was just the performance, that – considering any kind of presence, including the ones, in spirit, from the past, was really successfull. 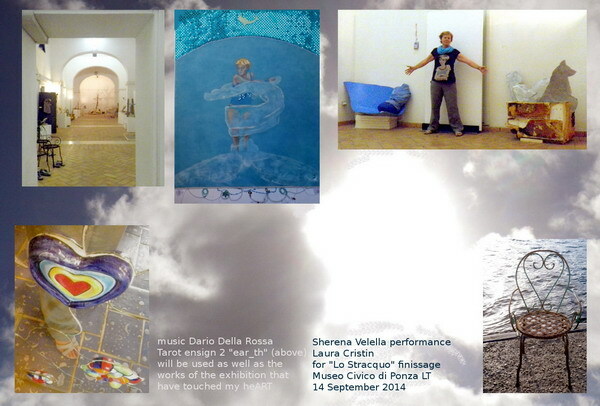 On September 14th, in Ponza, at Museo Civico of via Roma, I take part at the finissage of the exhibition “Lo Stracquo: l’arte che viene dal mare” with the performance “Sherena Velella”. From bottom right, anticlockwise: 1) stranded chair used by Charlotte Menin for her installation “Conversazioni di fondo”, 2) Laura Cristin among her work “Sherena Velella” and “Optimist” by Kika Bohr, 3) Tarot ensign # 2, alias “ear_th” painted in 2010, 4) main nave of the collective exhibition “Lo Stracquo” at Museo civico of Ponza LT, 5) detail of my foot in religious mode while entering the chapel inside “The Temperance” by Niki de Saint Phalle at the Tarots Garden in Capalbio GR, August 2014. In the background: heARTs in Ponza’s sky. 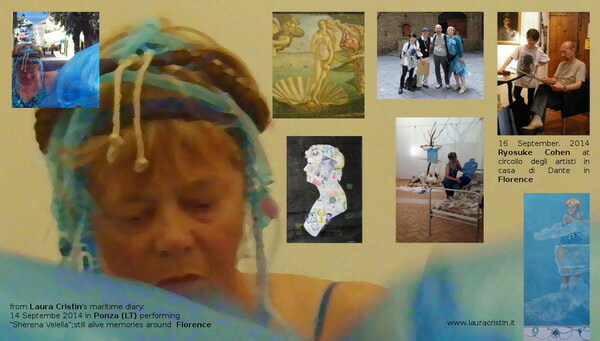 After having searched/worked about the interiority of the feelings/fillings of “Sherena Velella” bust/pillow, having installed it in the blue 100% pure plastic wave/veil stranded among many velella velellas in the isle of Ponza, time has come for a performance to interact with the whole collective exhibition. The place is the Civic Museum, aka “I cameroni dei confinati”, just above a big subterranean cistern of the Roman aqueduct. On the occasion of the finissage of “Lo Stracquo”, 5th edition of Ambientarte, on Sunday, September 14th, 2014 I will arrive in the island, in the very center of Mediterraneo at Long 12°E, coming from the places around Trieste where the same Sea reaches its further North at Lat 45°N. The Sea – the true protagonist of the works – will metaphorically come back. A stick-of-rain, the Tarot ensign # 2, that I named “ear_th”, a white, barely perceptible plastic veil for the foam of the waves etc will be the main instruments as long as the movements of my body and the music by Dario Della Rossa. Not-so-ephemeral presences that had most touched the heART of many, will take shape… just for a moment. “Lo Stracquo” exhibition is promoted by Azienda Speciale per l’Economia del Mare, municipalities of Ponza and Gaeta, Pinacoteca Comunale d’Arte Contemporanea of Gaeta. Organization by Cala Felci and Novecento association.